Place any order from our Etsy shop in April and be entered to win your choice of the Pamper Her or Pedicure Gift Bag, just in time for Mother’s Day! Like and Share to let your friends know! This gift bag is one stop shopping! Get everything you need to pamper yourself or a loved one. 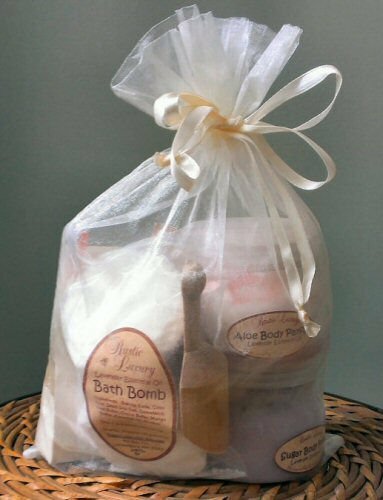 This gift set includes a full size aloe moisturizing parfait lotion, an emulsified sugar scrub, a bar of handcrafted moisturizing soap, and a set of bath bombs. It comes in a pretty organza bag and is ready for gifting! We have 2 different kinds of gift sets. One in our ever popular oatmeal milk and honey scent and one in relaxing lavender essential oil. Our Oatmeal Milk and Honey set comes with our Oatmeal milk and honey bar soap which is mild and great for all skin types. Our lavender gift set comes with our goats milk soap which is rich and moisturizing for dry skin. This gift bag is one stop shopping! Get everything you need to pamper yourself or a loved one. 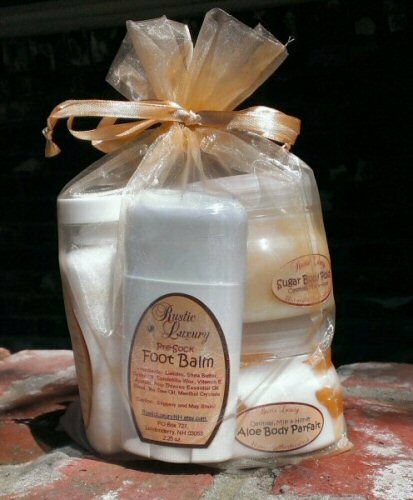 This gift bag includes all the luxurious products you would need to give yourself a pedicure. This gift set includes a bar of soap, an 8 oz bottle of our Foot Soak Salts, a full size Aloe Moisturizing Parfait Lotion, an Emulsified Sugar Scrub, and a tube of our Foot Balm. This set comes in a pretty organza bag and is ready for gifting!